Earth Mantra is proud to welcome Jonathan W. Mills (aka Slate) to our roster of artists, with his new album Clean Slate, a selection of the 'most ambient of the ambient' pieces he has composed and performed in some time. These songs come from themes inspired by a wide range of sources: visits to Pompeii and the Azores; an epic eight-CD science fiction cycle originating in Ylla, itself an album inspired by Ray Bradbury's The Martian Chronicles; an encounter with cancer; as well as nature, summers in Bristol (UK) and Manhattan, and his professional research into Rubel's extended analog computing and protein folding. Jonathan composes songs like he breathes: constantly. Since he first began to compose and perform in 2005, he has recorded over 600 songs that make up more than 40 albums. Even during the summer of 2008, after surgery and then radiation therapy for cancer, he kept composing, documenting his experience in the series of albums The Crab, Ground Zero, Hard Target, Resurrexíon and New Myths of Olympus. His contribution to Different Skies 2009, Oncologia, was suggested by the ensemble as a 'tribute to your survival' piece. The music of Slate is all performed live, directly to two tracks, without editing intermediate MIDI files, resulting in work that is natural, original and improvised. Since 2005, Jonathan has found a technique that fits his style of visual composition, and his total lack of formal training in music. Using two or three independent banks of synthesizers, a unique sonic texture is created for each piece. After practice and tuning, which might take several hours or several days, the final version of the song is performed and recorded live. Considering the quality of the end result, this organic approach to composition is remarkable indeed. 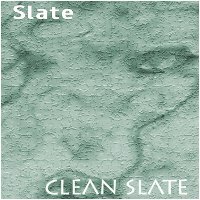 The tracks on Clean Slate are hard to categorize, combining elements of downtempo electronica, drone, light ambience, and orchestral composition. One of the things we like best about Jonathan's work is the refreshing originality and complete lack of obscurity; everything is very direct and above-board, and yet the compositions are still very well constructed and brimming with new ideas. And despite the clarity of the music, there is still something orthogonal about it, a cleverly applied dimension that is really difficult to pin down but is present in everything this incredibly prolific artist produces. Truly this is music that will make you think as much as it will soothe, relax, and entertain. So it is with great pleasure we unveil Clean Slate, by Jonathan Mills. Highly recommended. Original and exciting music, a real mind-journey, brilliant ! Thank you for impressive music.